Now, I take exception to the idea that junk food tastes better than real, nutrient dense food. But the fact of the matter is that my husband’s palate was trained on McDonald’s and he may never fully recover from that. That’s why I considered it a near-miracle when both he and Katie devoured a raw broccoli slaw delivered by my friend Whittney after Micah was born. It’s too good to keep a secret, so whip up a batch and enjoy! 1 cup mayonnaise - We love our homemade recipe. The trick to getting it thick is to pour the oil in super slow. 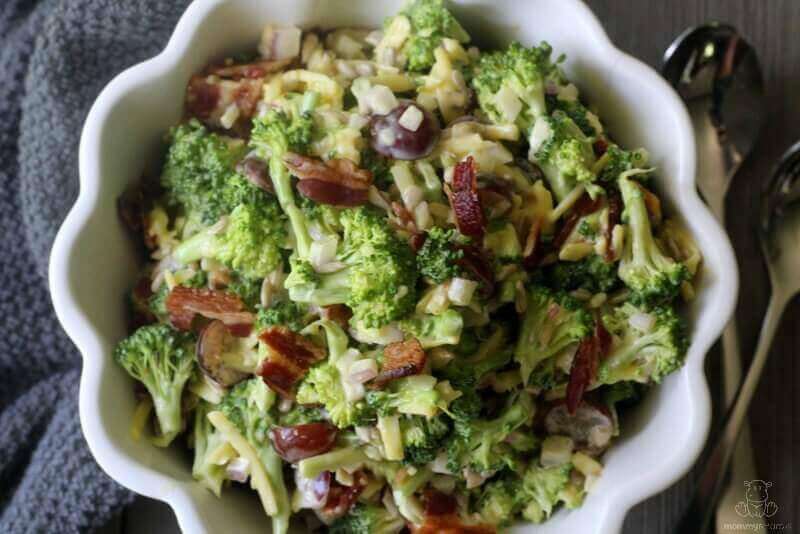 Place broccoli, grapes and onion in a large bowl. Pour in dressing and mix thoroughly. Sprinkle bacon and sunflower seeds over the top and serve. As you know, teen years spent working in fast food with Route 44 Cokes for breakfast have damaged my palate too. But I’m trying! I have learned that I like pretty much anything with bacon on it. I wouldn’t even look at asparagus until I got the crazy idea to add bacon bits and sliced almonds on top. Love it now. Bacon. Bacon. Bacon. Glad you’re sweet family enjoyed this as much as I do! Butter is my bacon. Add butter to anything and I will eat it! This is years later, I know, but this is hilarious! Poor guy must feel like he just dropped in from outer space! As I did, when I first started this real food journey, I might add. this actually looks delicious! i will definately be trying this out!! That looks so good! We will be trying this! We had it for lunch yesterday. So yummy 🙂 I used turkey bacon (baked in the oven). finally made this the other day – we LOVED it!! i made a few changes – Greek yogurt instead of mayo, pecans instead of sunflower seeds and i left out the bacon (because i didn’t have time to cook it) – DELICIOUS!! The Coconut Mama has a good coconut oil mayonnaise. In the comments section someone mentioned doing half coconut and half olive oil so I’m gonna try making the mayonnaise that way. I personally have never been a mayonnaise person but dont mind it in things such as this recipe (which I plan on making next week sometime – cant wait b/c it sounds delicious)! I’m glad to know about the coconut mayo. Thanks, Alexis! I had to scale back the mayo. You? @Kate We use homemade mayo, which I think has a lighter flavor and is more creamy, so it works well. Sometimes we scale back the cheese, though. Just depends how much broccoli I have on hand, I guess. i LOVE this!!! ans so does Sydney!! 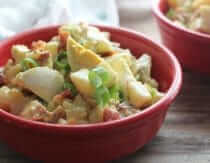 @Dianthe I didn’t realize so many people had tried this recipe. Yay! 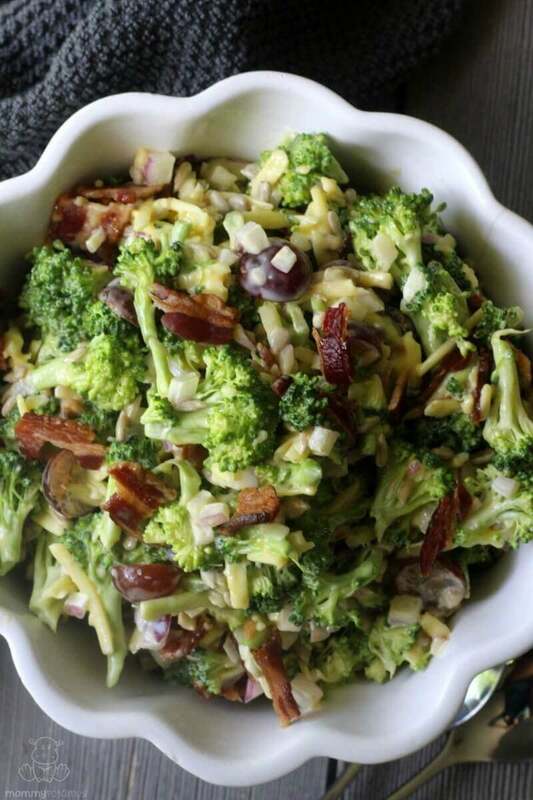 i tried it because Sydney loves raw broccoli but me, not so much – i substitute greek yogurt for the mayo and it’s delicious! It looks really yummy,I sure will try at home. Bought veganaise so I can make this! Okay…. that’s IT!!!! i need some of this slaw again STAT!!! what kind of cheese do you substitute on gaps? i’d like to make this again but the mozzarella isn’t legal. This was a scrumptious dish that everyone loved–we gobbled it right up. Thanks for sharing! Glad you liked it, Nikki! Love the recipe. I used baconaisse made from 1/2 olive and 1/2 bacon drippings from pastured pork bacon…and it makes it especially yummy. Thank you for sharing this! My family loved it! Wasn’t too sure how my husband was going to react, but he loved it and both our girls too (2 & 4)! This will definitely be added in our dinner rotation! 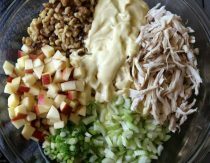 made this last night and we loved it – I substituted the mayo for plain greek yogurt and instead of grapes (couldnt find organic) used apples and raisons. very tasty and went great with our bbq chicken. Can I use something besides mayo? Homemade or not I can’t do it…can’t stand the taste, smell, etc. what about Greek yogurt? I’ve been searching for a Good chicken salad recipe maybe my kids will try but I won’t eat anything with mayo in it…therefore I never have it and my kids have never had it.. I meant slaw recipe! Got chicken salad on the brain! 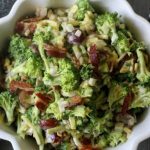 The is by far the best version of broccoli slaw I’ve ever had! Thanks for sharing it, Heather. Hi Heather! This looks super yummy! Three questions: best red wine vinegar sub for this recipe? Can this be made a day ahead, or is it best same day? Will frozen defrosted brocolli instead of fresh or ahould I lightly steam it and cool? My pregnant brain bought frozen instead of fresh brocolli. 🙂 Thank you!!! Making this again! We love it!! But didn’t you used to have red wine vinegar instead of lemon juice? I don’t remember the lemon juice or am I mixing this up with another recipe?? Thanks for the great recipes! !